"Vagrant" and "Vagabond" redirect here. For vagrant organisms, see Vagrancy (biology). For other uses, see Vagrant (disambiguation) and Vagabond (disambiguation). It has been suggested that Tramp and Loitering be merged into this article. (Discuss) Proposed since June 2018. Vagrancy is the condition of a person who wanders from place to place homeless and without regular employment or income. A person who experiences this condition may be referred to as a vagrant, vagabond, rogue, tramp or drifter. Vagrants usually live in poverty and support themselves by begging, temporary work, petty theft, garbage scraping or, where available, welfare. Both vagrant and vagabond ultimately derive from the Latin word vagari, meaning "wander". 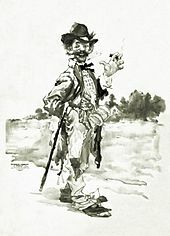 The term vagabond is derived from Latin vagabundus. In Middle English, vagabond originally denoted a criminal. In settled, ordered communities, vagrants have been historically characterised as outsiders, embodiments of otherness, objects of scorn or mistrust, or worthy recipients of help and charity. Some ancient sources show vagrants as passive objects of pity, who deserve generosity and the gift of alms. Others show them as subversives, or outlaws, who make a parasitical living through theft, fear and threat. Some fairy tales of medieval Europe have beggars cast curses on anyone who was insulting or stingy towards them. In Tudor England, some of those who begged door-to-door for "milk, yeast, drink, pottage" were thought to be witches. In premodern Finland and Sweden, vagrancy was a crime, which could result in a sentence of forced labor or forced military service. There was a "legal protection" (Finnish: laillinen suojelu) obligation: those not part of the estates of the realm (nobility, clergy, burghers or land-owners) were obliged to be employed, or otherwise, they could be charged with vagrancy. Legal protection was mandatory already in medieval Swedish law, but Gustav I of Sweden began strictly enforcing this provision, applying it even when work was potentially available. In Finland, the legal protection provision was repealed in 1883; however, vagrancy still remained illegal, if connected with "immoral" or "indecent" behavior. In 1936, a new law moved the emphasis from criminalization into social assistance. Forced labor sentences were abolished in 1971 and anti-vagrancy laws were repealed in 1987. In the Weimar Republic, the law against vagrancy was relaxed, but it became much more stringent in Nazi Germany, where vagrancy, together with begging, prostitution, and "work-shyness" (arbeitsscheu), was classified "asocial behavior" as punishable by confinement to concentration camps. In the Russian Empire, the legal term "vagrancy" (Russian: бродяжничество, brodyazhnichestvo) was defined in another way than corresponding terms (vagabondage, Landstreicherei) in Western Europe. Russian law recognized one as a vagrant if he could not prove his own standing (title), or if he changed his residence without a permission from authorities, rather than punishing loitering or absence of livelihood. Foreigners who had been twice expatriated with prohibition of return to the Russian Empire and were arrested in Russia again were also recognized as vagrants. Punishments were harsh: According to Ulozhenie, the set of currently empowered laws,[clarification needed] a vagrant who could not elaborate on his kinship, standing, or permanent residence, or gave false evidence, was sentenced to 4-year imprisonment and subsequent exile to Siberia or another far-off province. In the Criminal Code of the RSFSR (1960) [ru], which came into force on 1 January 1961, systematic vagrancy (that which was identified more than once) was punishable by up to two years' imprisonment (section 209). The Ordinance of Labourers 1349 was the first major vagrancy law in England and Wales. The ordinance sought to increase the available workforce following the Black Death in England by making idleness (unemployment) an offence. A vagrant was a person who could work but chose not to, and having no fixed abode or lawful occupation, begged. Vagrancy was punishable by human branding or whipping. Vagrants were distinguished from the impotent poor, who were unable to support themselves because of advanced age or sickness. In the Vagabonds Act 1530, Henry VIII decreed that "beggars who are old and incapable of working receive a beggar's licence. On the other hand, [there should be] whipping and imprisonment for sturdy vagabonds. They are to be tied to the cart-tail and whipped until the blood streams from their bodies, then they are to swear on oath to go back to their birthplace or to serve where they have lived the last three years and to 'put themselves to labour'. For the second arrest for vagabondage the whipping is to be repeated and half the ear sliced off; but for the third relapse the offender is to be executed as a hardened criminal and enemy of the common weal." In the Vagabonds Act 1547, Edward VI ordained that "if anyone refuses to work, he shall be condemned as a slave to the person who has denounced him as an idler. The master has the right to force him to do any work, no matter how vile, with whip and chains. 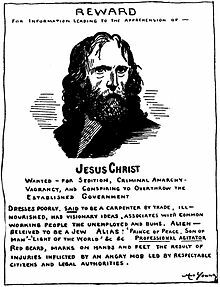 If the slave is absent for a fortnight, he is condemned to slavery for life and is to be branded on forehead or back with the letter S; if he runs away three times, he is to be executed as a felon...If it happens that a vagabond has been idling about for three days, he is to be taken to his birthplace, branded with a red hot iron with the letter V on his breast, and set to work, in chains, on the roads or at some other labour...Every master may put an iron ring round the neck, arms or legs of his slave, by which to know him more easily." The Vagabonds Act of 1572 decreed that "unlicensed beggars above fourteen years of age are to be severely flogged and branded on the left ear unless someone will take them into service for two years; in case of a repetition of the offence, if they are over eighteen, they are to be executed, unless someone will take them into service for two years; but for the third offence they are to be executed without mercy as felons." The same act laid the legal groundwork for the enforced exile (transportation) of "obdurate idlers" to "such parts beyond the seas as shall be [...] assigned by the Privy Council". At the time, this meant exile for a fixed term to the Virginia Company's plantations in America. Those who returned unlawfully from their place of exile faced death by hanging. The Vagabonds Act 1597 banished and transplanted "incorrigible and dangerous rogues" overseas. James 1: Any one wandering about and begging is declared a rogue and a vagabond. Justices of the peace in petty sessions are authorised to have them publicly whipped and for the first offence to imprison them for 6 months, for the second for 2 years. Whilst in prison they are to be whipped as much and as often as the justices of the peace think fit... Incorrigible and dangerous rogues are to be branded with an R on the left shoulder and set to hard labour, and if they are caught begging again, to be executed without mercy. These statutes, legally binding until the beginning of the 18th century, were only repealed by 12 Anne, c. 23. In late-eighteenth-century Middlesex, those suspected of vagrancy could be detained by the constable or watchman and brought before a magistrate who had the legal right to interview them to determine their status. If declared vagrant, they were to be arrested, whipped, and physically expelled from the county by a vagrant contractor, whose job it was to take them to the edge of the county and pass them to the contractor for the next county on the journey. This process would continue until the person reached his or her place of legal settlement, which was often but not always their place of birth. In 1821, the existing vagrancy law was reviewed by a House of Commons Select Committee, resulting in the publication of the, 'Report from the Select Committee on The Existing Laws Relating to Vagrants'. After hearing the views of many witnesses appearing before it the Select Committee made several recommendations . The Select Committee found that the existing vagrancy laws had become overly complicated and that they should be amended and consolidated into a single Act of Parliament. The payment of fixed rewards for the apprehension and taking vagrants before Magistrates had led to abuses of the system. Due to the Poor Laws, vagrants to receive and poverty relief had to seek it from the Parish where they were last legally settled, often the Parish where they were born. This led to a system of convicted vagrants being 'passed' from Parish to Parish from where they had been convicted and punished to their own parish. The 'Pass' system led to them being transported by vagrancy contractors, a system found to be open to abuses and fraud. It also found that in many instances the punishment for vagrancy offences were insufficient and certain types of vagrants should be given longer prison sentences and made to complete hard labour during it. 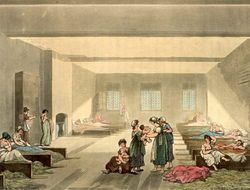 Based on the findings and recommendations from the 1821 House of Commons Select on Vagrancy, a new Act of Parliament was introduced, 'An Act for the Punishment of Idle and Disorderly Persons, and Rogues and Vagabonds, in that Part of Great Britain called England', commonly known as the Vagrancy Act 1824. The Vagrancy Act 1824 consolidated the previous vagrancy laws and addressed many of the frauds and abuses identified during the Select Committee hearings. Much reformed since 1824, some of the offences included in it are still enforceable. After the American Civil War, some Southern states passed Black Codes, laws that tried to control the hundreds of thousands of freed slaves. In 1866, the state of Virginia, fearing that it would be "overrun with dissolute and abandoned characters", passed an Act Providing for the Punishment of Vagrants. Homeless or unemployed persons could be forced into labour on public or private works, for very low pay, for a statutory maximum of three months; if fugitive and recaptured, they must serve the rest of their term at minimum subsistence, wearing ball and chain. In effect, though not in declared intent, the Act criminalized attempts by impoverished freedpeople to seek out their own families and rebuild their lives. The commanding general in Virginia, Alfred H. Terry, condemned the Act as a form of entrapment, the attempted reinstitution of "slavery in all but its name". He forbade its enforcement. It is not known how often it was applied, or what was done to prevent its implementation, but it remained statute in Virginia until 1904. Since at least as early as the 1930s, a vagrancy law in America typically has rendered "no visible means of support" a misdemeanor, yet it has commonly been used as a pretext to take one into custody for such things as loitering, prostitution, drunkenness, or criminal association. The criminal statutes of law in Louisiana specifically criminalize vagrancy as associating with prostitutes, being a professional gambler, being a habitual drunk, or living on the social welfare benefits or pensions of others. This law establishes as vagrants all those healthy adults who are not engaged in gainful employment. In the 1960s, laws proven unacceptably broad and vague were found to violate the due process clause of the Fourteenth Amendment to the United States Constitution. Such laws could no longer be used to obstruct the "freedom of speech" of a political demonstrator or an unpopular group. Ambiguous vagrancy laws became more narrowly and clearly defined. Flâneur as a localized drifter. ^ "vagrant - Definition of vagrant in English by Oxford Dictionaries". Oxford Dictionaries - English. ^ "Evangelii Gaudium : Apostolic Exhortation on the Proclamation of the Gospel in Today's World (24 November 2013) - Francis". w2.vatican.va. ^ Original definition: "se, joka ilman elatusta omista varoistaan tahi toisen huolenpidon kautta työttömänä kuljeksii harjoittaen siveetöntä ja säädytöntä elämää..."
^ "Teema: Irtolaisuus – Portti". wiki.narc.fi. ^ Ayaß, Wolfgang (1992). Das Arbeitshaus Breitenau. Bettler, Landstreicher, Prostituierte, Zuhälter und Fürsorgeempfänger in der Korrektions- und Landarmenanstalt Breitenau (1874–1949). Kassel. ISBN 978-3881226707. ^ Marx, Karl (1976). Capital Volume I. Ernest Mandel, Ben Fowkes. England: Pelican Books. p. 896. ISBN 978-0-14-044568-8. ^ Marx, Karl (1976). Capital Volume I. England: Pelican Books. pp. 898–99. ISBN 978-0-14-044568-8. ^ a b Hitchcock, Tim; Crymble, Adam; Falcini, Louise (13 December 2014). "Loose, idle and disorderly: vagrant removal in late eighteenth-century Middlesex". Social History. 39 (4): 509–27. doi:10.1080/03071022.2014.975943. hdl:2299/15233. ^ Hammond, J L; Barbara Hammond (1912). The Village Labourer 1760-1832. London: Longman Green & Co. p. 19. ^ a b c "Report from the Select Committee on The Existing Laws Relating to Vagrant". U.K Parliamentary Papers. 1821. Retrieved 4 May 2018. ^ "The Vagrancy Act 1824 (as originally enacted)" (PDF). Legislation.Gov.UK. Retrieved 4 May 2018. ^ "The Vagrancy Act 1824 (current version)". legislation.gov.uk. Retrieved 6 May 2018. Beier, A.L. ; Ocobock, Paul, eds. (2008). Cast Out: Vagrancy and Homelessness in Global and Historical Perspective (1st ed.). Athens, Ohio: Ohio University Press. ISBN 978-0-89-680-262-9. Fumerton, Patricia (2006). Unsettled: The Culture of Mobility and the Working Poor in Early Modern England. Chicago, Ill.: University of Chicago Press. ISBN 978-0-22-626955-9.